I didn’t even know I liked persimmons. But boy am I glad I stumbled upon these heart-shaped Hachiya ones at the farmers market. You must let them ripen until deep orange and swishy soft. You will then be rewarded with sweet, creamy flesh that leaves a slight astringent residue on the teeth. It’s a perfect fall fruit. I think I ate them in China but really am trying them again for the fruit time here. The Hachiya kind are much softer and sweeter than the more common, flat fuyu variety. Here are some persimmon desserts I’d like to try: a semifreddo and this sundae recipe, although I would just use plain vanilla ice-cream, or better yet, vanilla Coconut Bliss, which is all the rage here. 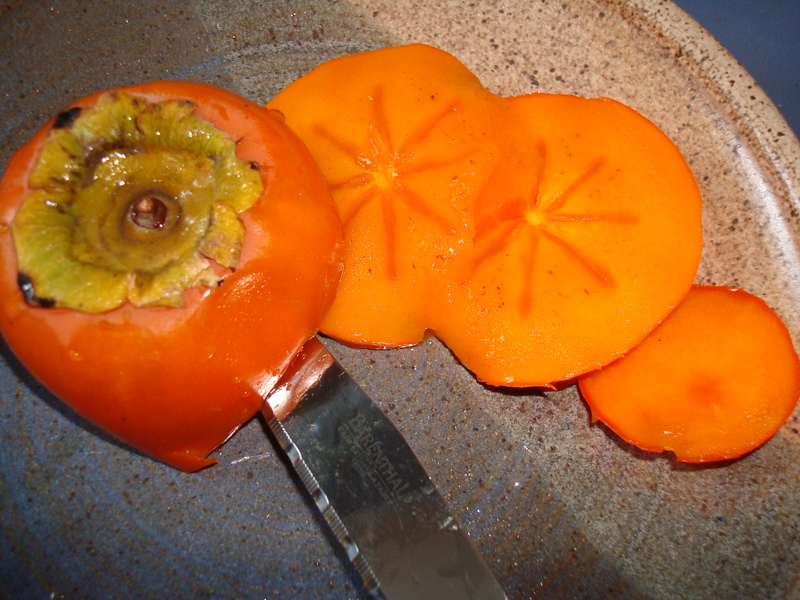 Oooh ohhh I love those Oregon persimmons!! I remember them well! Though I never thought to eat them with the BLISS–lucky, LUCKY woman you are! Aren’t those luscious heart-shaped ones just pure ambrosia? Thanks for posting on my blog. Hope to meet up with your friend sometime and let me know when you’re next in Oregon.